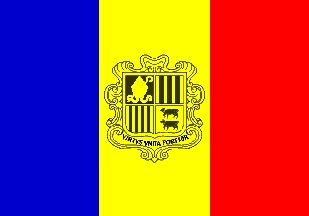 The official name Principality of Andorra is a country govern by Unitary parliamentary Semi-Elective diarchy. It covers 467,63 square kilometres, and are home to 85.470 citizens. 92% Christians, 5% Agonistic and 1% Muslims. The currency is Euro, worth 7,46 Danish Krone. The GDP is US$4.510 billion. Andorra has an alpine climate and continental climate in the lower parts. Despite the size, here are quite some larger mammals - mainly due to the mountains an neighbors. One might see the Wildcat (Felis silvestris), Eurasian lynx (Lynx lynx), Iberian lynx (Lynx pardinus), Red fox (Vulpes vulpe), African golden wolf (Canis anthus, Iberian wolf (Canis lupus signatus), Brown bear (Ursus arctos), Eurasian badger (Meles meles), Boar (Sus scrofa), different deer, Pyrenean chamois (Rupicapra pyrenaica) and a some bats. The most interesting animal might be the cave-dwelling ground beetle (Hypotyphlus andorranus) and a round fungus beetle (Speonomites andorranus). The flora is dominated by Alpine plants like carnations, violets, bellflowers, and daisies, as well as blackberries, wild strawberries, and mosses. 14/4. I arrival in the morning from France, and I wished the weather was better. It is murky and there are a constant drizzle. The border is in high altitude, and symbolic: I doubt here are any officers! I drive right into a tunnel, hoping it will lead to lower land and better weather. It does not, but here are some nice landscapes and pretty houses in almost black slate. Most seem to be supported by the waste ski industry, although here are some odd cows in some towns. I se no sign of timbering or farming. Most houses seems to be fairly new, or at least well maintained. Only a few farms houses, churches and houses within the capital look old. Here are a few towns, but also many houses along the few roads, winding their way from one valley to the next. I find a supermarket and stock some food, and then it is off to the first sight: Sant Joan de Caselles Church. It should be the "Country's finest Romanesque chapels", but that only say something about the country. Behind it leads a narrow road into the mountains, and to judge from the map, it must be interesting. It leads way up the mountain, offering a nice - although slightly misty - view to the valley and all the ski hotels. The higher parts are covered in snow, and eventually, the road is blocked, as it is not cleared for snow yet. Some pines do fine, but apparently only to a certain age. I head back down, and passes the mail valley, which is high enough to still have a feeling of winter. The next sight is another old church; Sant Martí Church in La Cortinada. It look pretty much the same, and again, a zigzagging road behind it lead into the mountains. At first, it is through pine covered mountain sides, then the snow dominates. Actually, the road lead to a large and very active skiing area. The road end abruptly in a big pile of snow. I return, and drive slowly down, while I enjoy the waterfalls, early plants, great views and the heat in the car. The road follow the river in the button of the valley, and some nice old stone bridges are crossing it. I end up in the capital; Andorra la Vella, and find a place to park. It is only a light drizzle down here, and compared to the heights; almost mild. I walk around the centre of town, and try to find the most beautiful buildings and squares. I am sure it will be a lovely city on a spring day, and even today, it is cosy. Many of the houses have strange shapes, there are many plants all over, and plenty of pedestrian areas. But; it is not spring here yet, and when the rain pick up, I head on to next country; Spain. It have been a short day, but that is due to the weather. At least, it have been cheep: I have only spend €7,30 on road and parking, €7,98 on gadgets and €3,36 on food. I have driven 102 kilometres (that will be €4 in Diesel), and taken 217 photos. The tour in general.